What changes make the 2018 BMW X5 different? Minor equipment shuffling and sportier transmission behavior as BMW winds down a design generation of its midsize crossover SUV. In the wings is an all-new X5 for model-year 2019. It’ll have different styling and larger dimensions and promises better performance and fuel economy. The 2018 X5 continues as one of the older entries in the premium-midsize-crossover class. It’s still a worthwhile rival for the likes of the Mercedes-Benz GLE and a sportier alternative to the segment sales leader, the Lexus RX. It returns with one of the broadest range of powertrains in the competitive set, including six- and eight-cylinder engines, a diesel, and a plug-in-hybrid. Atop the line is the 567-horsepower X5 M from the German automaker’s high-performance division. Most models are available with a small third-row seat that increases passenger capacity to seven from the standard five. Mostly because you’re getting a deal too attractive to pass up. The 2014-2018 iteration of the X5 has sold well, thanks in part to the surge in demand for all crossovers. Its powertrains are exemplary, build quality is solid, and passenger space generous – although the optional third-row seat is merely kid-sized. On the downside, steering precision and handling composure fall short of the lofty expectations associated with the BMW badge. At roughly $60,000-$102,000 (including destination fee) base prices are steep, too, although that’s expected in this class. Options are pricey, as well. Buying a 2018 X5 will, however, position you to exploit model-year-closeout sales as dealers clear inventories to make way for the redesigned ’19s. The ’18 lineup begins again with the six-cylinder sDrive35i, the only rear-wheel-drive offering. 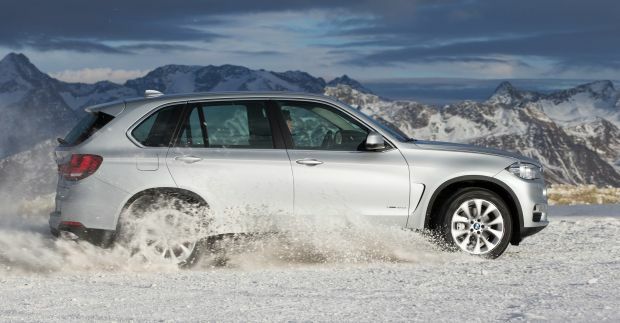 Its xDrive35i counterpart, like every other X5, comes with BMW’s xDrive all-wheel-drive (AWD) system. 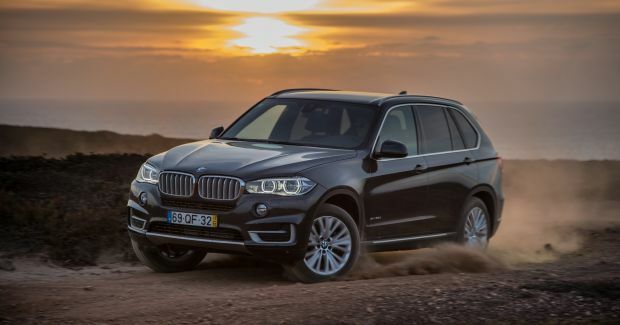 Also returning is the V-8 xDrive50i, the diesel-powered xDrive35d, and the line-topping V-8 X5 M. The plug-in-hybrid xDrive40e (full name: X5 xDrive40e iPerformance) model teams a four-cylinder engine with electric-motor power and can travel 14 emissions-free miles on an initial charge before the gas engine kicks in. Slotting into BMW’s crossover lineup above the compact-class X3, the X5 plays the upscale-family-hauler role while its fastback cousin, the X6, is the far-less popular urban-fashion alternative. Come early calendar 2019, the X5 will be supplanted as BMW’s biggest crossover by the first ever X7, a full-size model with an adult-sized third-row seat and usable cargo space behind. Yes, if you’re intrigued by the sea change coming for BMW’s second-best-selling vehicle (the 3 Series premium-compact car is No. 1). The ’19 X5 will adopt the German automaker’s newest vehicle understructure, called Cluster Architecture, or CLAR. The new platform is also the basis for the recently redesigned 5 Series and 7 Series cars and the next-generation 3 Series and X6. Due in showrooms by late calendar 2018, the fourth-generation X5 will continue with seating for five standard; whether a third row will again be available is unknown, but the new X5 should be roomier overall than today’s model. It’ll also reprise a range of gas engines and plug-in-hybrid model; a diesel is uncertain. Weight savings attributed to the CLAR platform will permit use of a four-cylinder engine for the first time in a non-hybrid X5. It should also mean better performance and mileage for the returning engines. CLAR’s added structural rigidity should also improve road manners, ride comfort, even occupant safety. Among expected new convenience and connectivity features is predictive suspension adjustment. The sDrive35i, xDrive35i and xDrive35d shed their round tailpipes for the trapezoidal outlets found on the other non-M-grade X5 models. That’s the only change to a crossover that retains the muscular-stance and sharp creases that came with its 2014 redesign. Interestingly, this third-generation X5 never got a midcycle facelift. BMW instead elected to abbreviate its lifecycle, from the expected eight model years to just six, and to introduce the CLAR-based replacement for 2019. That’s evidence of the pressure on automakers to accelerate turnover in the hotly competitive premium-crossover market. With this year’s tail-pipe uniformity, visual differences among X5 versions are even less obvious, aside from model badging. The X5 M does come with more aggressive-looking accoutrements, notably a front fascia with larger and deeper air intakes – plus quad tailpipe outlets. But much of its appearance is available on the other models via the M Sport Package. This $4,350 option ($4,450 for the xDrive50i) includes an aerodynamic body kit and BMW’s Shadowline trim that darkens much of the exterior brightwork. The Package adds specific 19-inch M Light alloy wheels; similar 20- and 21-inchers are available at extra cost. 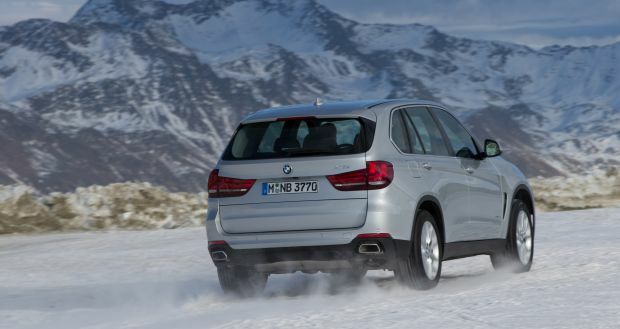 Otherwise, all the non-M X5s come with 19-inch alloy wheels with all season run-flat tires. Available with the Premium Package are 20s; 21s shod with summer performance tires are a $1,550 option for all but sDrive35i and xDrive40e. Every X5 comes with LED fog lights and satin aluminum roof rails; aluminum running boards are a $400 option. In overall length, the X5 is class-average, but its wheelbase (the distance between the front and rear axles) is among the longest. That provides the brief sheet-metal overhangs that contribute to its athletic bearing and helps give first- and second-row passengers generous space. They get firmly supportive seats in the best German tradition, though most models come with BMW’s faux-leather SensaTec upholstery. Leather is standard on the xDrive50i and a $1,450 option on the other non-M X5s; order it and you can cover the dashboard in leather for another $1,200. Extended-coverage Merino leather upholstery is standard on the X5 M and a $3,700 upgrade on the other models. Every X5 comes with a choice of brushed aluminum or real wood cabin trim at no extra cost; piano black trim is $1,080 and fillips like ceramic controls are available at $650. As with its exterior treatment, the M Sport package includes standard M-model interior touches, such as the M-design steering wheel, alternate wood or aluminum trim, sport front buckets with extra bolstering; multi-contour seats with additional adjustments are a $950 optional on all X5s. Cargo volume is also above the class average, at 35.8 cubic feet behind the second row and 76.7 with it folded. Credit BMW with retaining those volumes for the xDrive40e plug-in hybrid by packaging its lithium-ion battery pack efficiently below the cargo-bay floor. Available on all but the xDrive40e and X5 M, the third-row seat is best considered occasional transport space for kiddies. And there’s room for a line of grocery bags behind it, but not much else. The split/folding bench is a convenience but doesn’t really put the X5 in league with dedicated seven-passenger premium-midsize crossovers, such as the Acura MDX, Infiniti QX70, Land Rover Discovery, and Volvo XC90, which are all longer overall. Priced at $1,700, it includes dedicated climate controls and a rear-axle air suspension. It can’t be ordered in conjunction with the Dynamic Handling Package or the M Sport Package. Just one: the automatic transmissions that had been included in the M Sport option package are now standard. All X5 transmissions retain eight gear ratios, but the change is designed to enhance performance. The Sport Automatic transmission replaces the Steptronic Automatic as standard equipment on the 35i, 35d, and 50i models. The Sport Automatic provides quicker gear changes than the Steptronic, and is calibrated to maintain engine rpm that optimizes acceleration and throttle response. It includes steering-wheel-mounted paddle shifters and, in manual mode, won’t automatically downshift at redline. The xDrive40e retains the Steptronic as standard but for 2018 gets the M Sport version with steering-wheel-mounted shift paddles. The ’18 X5 M retains its own, maximum-performance version of the Sport Automatic. Engines are unchanged. The sDrive35i and xDrive35i retain a 3.0-liter turbocharged inline-six-cylinder with 300 horsepower and 300 pound-feet of torque. The xDrive50i again sports a 4.4-liter twin-turbo V-8 with 445 horsepower and 480 pound-feet of torque. The xDrive35d remains among the few diesel-engine vehicles still on sale in the U.S. Its 3.0-liter turbocharged inline six has 255 horsepower and 413 pound-feet of torque. The X5 M gets a version of the 4.4-liter twin-turbo V-8 with 567 horsepower and 553 pound-feet of torque. The xDrive40e teams a 2.0-liter turbocharged four-cylinder with electric-motor power for a net output of 308 horsepower and 332 pound-feet of torque. Being a plug-in hybrid, you can give the battery an initial charge from a residential or commercial outlet, optimally using a 240-volt supply that requires about three hours for a full charge. The xDrive40e can travel about 14 miles on electric power alone before the battery is depleted. It can reach 75 mph on battery power alone, but such speed accelerates battery depletion. When there’s insufficient charge to operate on battery power alone, the xDrive50i’s system automatically switches to conventional-hybrid mode. In that state, sensors determine the best mix of gas and battery assist and the battery is recharged via regenerative braking and coasting. Smooth, responsive, and eager, every X5 powertrain is an exemplar of its type. BMW says the diesel and plug-in-hybrid models do 0-60 mph in 6.5 seconds and the 35i models in 6.1. It pegs the 50i at 0-60 in 4.7 seconds and the X5 in 4.0. A vault-like structure imbues every X5 with a rock-solid feel, but the downside is some unexpected shuddering over bad pavement with the 20-inch tires and especially with the 21s. That downside can also upset your line through a bumpy turn. Disconcerting as well is steering that’s heavily weighted but not particularly precise. Barreling down the Interstate, these crossovers feel stable as locomotives. In other circumstances, they too often lack the fluidity and composure expected of the best BMWs. About on par with premium-midsize-crossover rivals of similar size and power. EPA ratings are 18/25/21 mpg city/highway/combined for the sDrive35i and 18/24/20 for the xDrive35i. The xDrive35d rates a pleasant 23/29/25 mpg, but the xDrive50i just 15/21/17 and the xDrive50i a sobering 14/19/16. The xDrive40e plug-in rates 56 mpg-e (equivalent), the EPA’s calculation for the theoretical gas consumption of a vehicle running on exclusively on electricity. Operating as a conventional hybrid, the xDrive40e rates 23/25/24 mpg city/highway/combined. BMW recommends 91-octane or higher for the gas engines, including for the xDrive40e, and requires a regular regimen of AdBlue emissions-system additive for the xDrive35d. Nothing new, per se, but some re-arrangement adds to the ’18 X5’s value proposition – and brings it a little more in line with the level of standard equipment expected at these prices. For example, a rearview camera is now included with all X5s; it had been a $400 stand-alone option for most models and was included, along with a head-up instrument display, in the $1,400 Driver Assistance Package. BMW also makes it a bit easier to cherrypick options. A heated steering wheel is now a $190 stand-alone option (it remains part of the M Sport and Premium packages), while heated rear seats are similarly available for $350. Previously, you had to buy the $550 Cold Weather Package to get either – although the package had also included retractable headlight washers. You can now also acquire the semi-autonomous parking system, including its 360-degree-view camera, as a $700 option without also having to spring for the $1,400 Driver Assistance Package. Unfortunately, BMW continues to charge extra for some critical safety systems. The $1,700 Driving Assistance Package includes autonomous emergency braking that’ll stop the X5 to avoid a frontal collision from speeds below 37 mph. It also warns of unintended lane changes with a visual alert and a vibration through the steering wheel, but does not automatically steer you back. The package includes the head-up instrument display, too. Order the Driving Assistance Package and you’re eligible to get the $1,200 Driving Assistance Plus Package. This enhances autonomous emergency braking to include higher speeds and adds adaptive cruise control that maintains a set distance from traffic ahead and works in stop-and-go-traffic. Some of these safety features are also included in various packages, including the Premium and M Sport options, and on the X5 M, in the $6,100 Executive Package. But getting them still requires an extra outlay above the vehicle’s base price. In addition to the standard interior and exterior features mentioned earlier, every 2018 X5 comes standard with an imbedded navigation system, a power-adjustable steering column, a power liftgate, a panoramic moonroof, automatic dimming interior and exterior rearview mirrors, and heated power front seats with power lumbar support. Xenon headlamps with LED fog lamps are standard. Steering linked LED headlamps with automatic high beams are part of the $1,900 Lighting Package, though you must order the M Sport or Premium packages to get it. On the X5 M, the headlight upgrade is included in the Executive Package. Modest increases for 2018 keep X5 prices competitive with rivals from Mercedes, Range Rover, Porsche, and Tesla in the upper echelon of this segment. Base prices include BMW’s $995 destination fee. The 2018 sDrive35i starts at $57,945 and the xDrive35i at $60,245. Base prices are $61,745 for the xDrive35d diesel, $64,495 for the xDrive40e plug-in hybrid, and $74,795 for the V-8 xDrive50i. The ’18 X5 M is priced from $101,695. Among popular options not already detailed, the Premium Package ($1,150, or $1,600 on the xDrive50e) includes the basic driver-assistance systems, plus a heated steering wheel, four-zone automatic climate control, and keyless entry with hands-free liftgate activation. The Executive Package ($2,550-$2,950, depending on model) includes the adaptive LED lighting, soft-close automatic side doors, and in place of analog gauges, BMW’s reconfigurable Dynamic Digital Instrument Cluster. Standard on the X5 M and available on xDrive35i, 50i, and 40e models as part of the $4,500 Dynamic Handling package, are driver-selectable suspension settings, rear-axle torque vectoring, and Active Roll Stabilization that counteracts body lean in turns. Ventilated multi-contour front seats are included in the $1,350 Luxury Seating Package, and Ivory White and Mocha interior design packages cost $1,950. Exterior paint colors other than non-metallic black or white cost $550 for a range of basic metallic hues, and $1,950 for premium metallic black or silver shades. Release date for the 2018 X5 was Sept. 1, 2017.